With just 1,344 votes between New Right and the Knesset, Election committee approves request for partial recount. 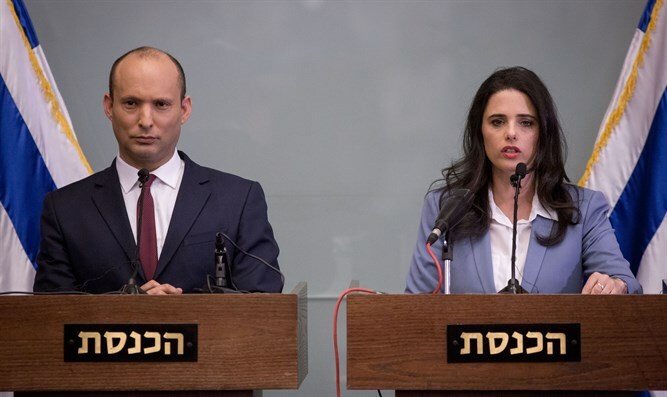 The New Right party of Education Minister Naftali Bennett and Justice Minister Ayelet Shaked will conduct a partial vote recount following last Tuesday’s election, after receiving approval from the Central Elections Committee Sunday evening. Judge Hanan Melcer, the chairman of the Central Elections Committee, green lighted a request by the New Right to conduct a recount of votes in 300 ballot boxes which were used for special votes – the double-enveloped ballots cast by Israeli citizens unable to vote at the ballot nearest to their home. These voters include voters who were hospitalized during the election, soldiers stationed at bases across the country, prisoners being held in correctional facilities, foreign service officials working overseas, and disabled voters unable to reach the polls. The Central Elections Committee has been correcting errors in the uploading of data into the system, which produced a number of irregularities in the turnout rate for certain towns, as well as votes for one party mistakenly credited to another party. Nevertheless, as of Sunday evening, the New Right is still 1,344 votes short of the 139,898 votes required to enter the Knesset, out of a total of 4,308,446 valid ballots cast. The New Right has claimed, however, that it has received reports of some hundreds of irregularities in the counting of votes, particularly with regards to the special double-enveloped ballots. The party had hoped last week that the soldiers’ votes would put the New Right over the top. Earlier on Sunday, the Central Elections Committee pushed back on the New Right’s allegations of widespread irregularities, calling the claim a “misrepresentation”. ← New PA cabinet formulates plans to strengthen Palestinian steadfastness in Area C and in eastern Jerusalem.